[ENGLSIH] Þórsmörk translates as `The Forest of Thór` a hammer-wielding god of the Scandinavian mythology. 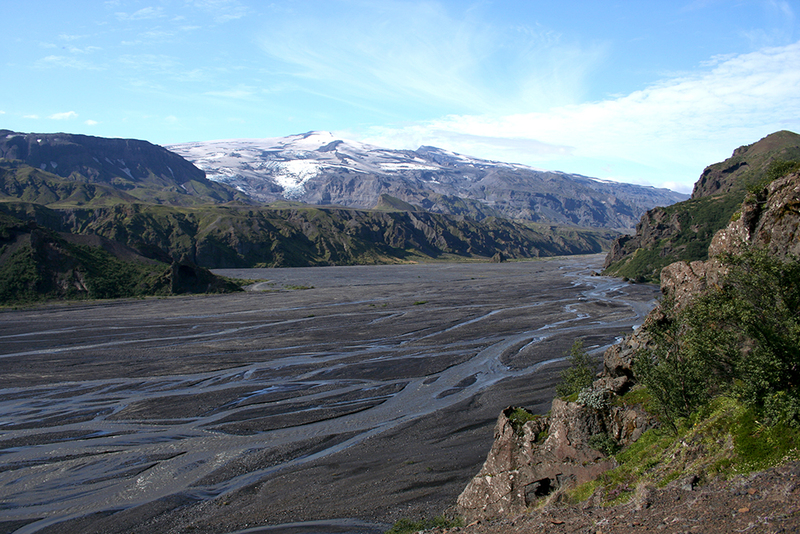 So you`d be surprised to find more than 170 plant species growing in this beautiful site between three glaciers: Tindfjallajökull, Eyjafjallajökull and Mýrdalsjökull. There are many marked walking paths here, so it is popular to hike and camp. One of the most spectacular treks in Iceland starts here and ends in Skógar. Not only do you have the oppurtunity to walk and camp between two glaciers, you will also cross the crater of the infamous `Eyjafjallajökull`-the volcano that erupted in 2010. Here can take a break in the warm lava fields created by this volcano – a free sauna! The length of this trek is around 25 km and it takes about 10 hours by foot. Remember to take warm and waterproof clothes and shoes if you decide to hike in this area. It is also important to take some food and water for more than one day to be ready for any emergency. You should bring your own bag for your waste so that you do not pollute the environment and do not forget to charge your mobile phone so that you can contact someone if you need help. Check the forecast before starting your journey and be aware that weather in Iceland can change very quickly so be prepared to dress for all possibilities. Maps are useful not to get lost, but remember that Iceland can be unpredictable so your security depends on your own common sense: don’t try to walk new paths or do to difficult trekking without the appropriate equipment. Ideally, go with someone who has done the trek before so is more experienced than you. This entry was posted in English and tagged Eco Messengers, Eco Tips, Iceland, Laugavegurinn, Thorsmork, Tips Iceland, visit Iceland on July 19, 2013 by ecotipsiceland.